Description: This mixed freight had to be at least 100 cars long. It's surprising what two SD40-2s can haul. Description: NS Southbound Freight Train at Irondale, Al. Description: BNSF 6384 (ex-BN 6384) on NS rounding the wye heading in the NS yard in Columbus. Description: NS Eastbound Military Train 057 rumbles through Lovick, Al. on its way to Ft. Benning in Columbus, Ga. Description: NS Eastbound Military Train 057 passing through Lovick, Al. on their way to Fort Benning in Columbus, Ga. Description: A mixed freight heads West past Victoria St. Trailing is CEFX 6001. Description: Rusting now, the 6384 leads the 6775 towards Saint Paul leaving the 7821 watching in the distance. The 7821 has been assigned to yard service at Northtown since about 2003! 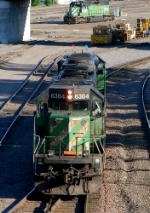 Description: Lotsa stuff to see, including the 1400 along with the BNSF 6520, an SD45-2B. Description: After shooting this out in South Dakota a few days back, its back at Northtown. Maybe my last shot of it with this number.